This is arguably Australia’s most demonstrably outstanding success story in terms of cross-cultural collaboration on which we should continue to build"
One of the primary aims of the Australian Art Orchestra has been to create situations allowing for a free and open exchange of musical and dramatic ideas between different cultures and traditions. This project is one such exchange. The AAO has been collaborating with Guru Kaaraikkudi Mani (one of the greatest exponents of the complexities of Carnatic music) on this project, since 1996. 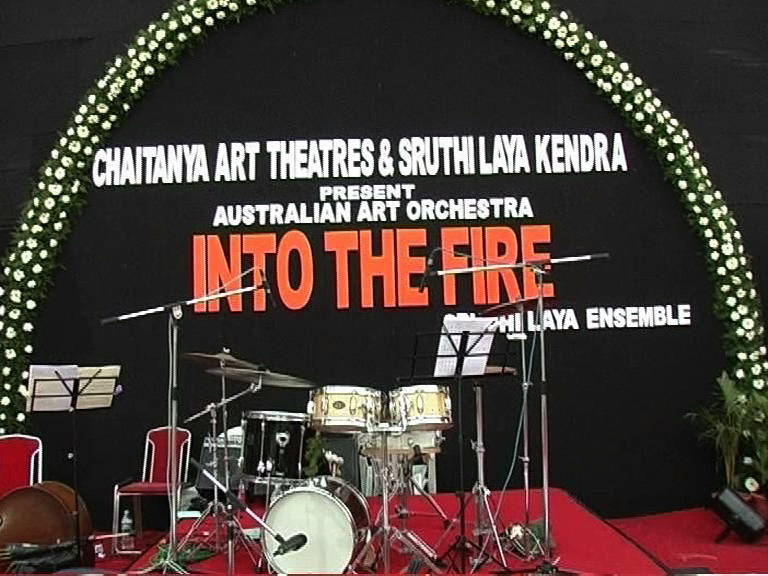 From this point on, this project has been performed throughout India, Europe, Australia and Asia; wowing audiences throughout the world with its intoxicating blend of music, percussion and dance, producing new works under the titles The Chennai Sessions, Into The Fire and Two Oceans. The rhythmic intricacies and improvising practices that reside at the core of both the South Indian Carnatic tradition and the Western jazz tradition are revealed in this program in virtuosic splendour. Rich in power, beauty and originality, this collaborations explores a new style of music built on the rock solid foundation of the Carnatic tradition with Western interpretations, performed both on South Indian and Western instruments.